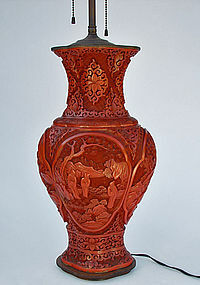 A Chinese carved cinnabar lacquer vase (converted into a lamp) decorated with four shaped panels of scholars on a mountainous landscape, the background with scrolling floral borders and motifs. The quality of the carving is one of the best from its period (probably late 19th century) and is in excellent condition – some chips and minor hair lines. It was converted into a lamp sometime later. It works perfectly as a lamp, although there is one area taped (with black tape) on the cord. All and all, the color is darker than shown in the photos. Dimensions of vase: 16" height x 9 1/4" width x 7" deep, 17" height including wood piece at the bottom to top metal (copper) capping on the shoulder tip. The total height is 26 3/4".